Find here: posts about visits to collections, exhibitions, and so on. Sanquhar gloves: an exemplification of Deep Local to Pan Global? After a lot of planning and preparation, my gloves went on display in the window of Prick Your Finger, the yarn shop and textile space in Bethnal Green. Consisting of three square frames and a display cabinet, making decisions about what to put in was difficult. In the end, I put in the last two pairs I’ve made in a frame with the design work for one of them in another frame. The first ones went into the display case to show the traditional start of the gloves; there are patterns for these in the shop so people might be tempted to buy the pattern and some wool to knit them. Then the last frame was filled with ones that matched the first two frames terms of colour palette. And now for something completely different: Sal’s gloves, with her hands in them – lots of stripes and darns and mends! The display cabinet is on loan from the Knitting & Crochet Guild Collection and is perfect for the space and contents: thanks to the KCG for this. 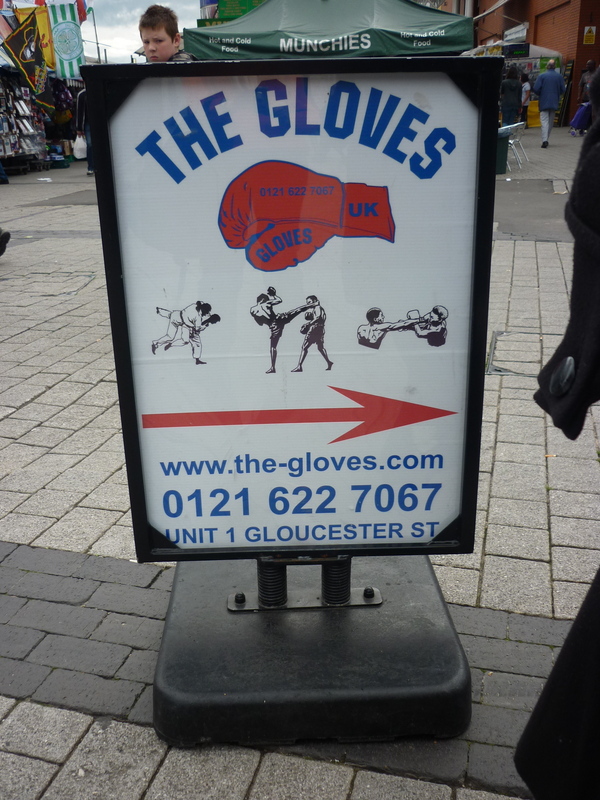 This month I’ve been to two collections to see and study the gloves they have. These dates have to be arranged months in advance as the appointments get booked up so I went to Bath in early November to the Fashion Museum there and last week to the V& A Clothworker’s Centre. houses the early part of the collection which belongs to the Worshipful Company of Glovers. They have a great on line catalogue and from that I was able to see that they have about a dozen, perhaps more, knitted gloves from the 16th and 17th centuries, most of which are, or were, ecclesiastical. These gloves are beautifully stored and conserved, each pair, or sometimes a single glove, has its own archival box and is wrapped in calico within that. The gloves have a hand shaped support inside them that extends from the wrist so the whole thing can be lifted from the box and turned over. What I wasn’t prepared for was the quality and fineness of the work. The gauge that I was able to measure seemed to be about 10 sts = 1cm, or 25 sts to the inch. Bear in mind that all the yarn was hand spun and dyed without the aid of chemical dyes. The amount of work and skill needed to make these is unbelievable. The earliest examples are certainly hand knitted but later ones are frame knitted and shaped by cutting and piecing the fabric. Many are embellished with hand embroidery in metallic thread, either silver or gold. A couple of interesting points: some later gloves were made as fashion items but in ecclesiastical workshops while two pairs from the 17th century, one ecclesiastical and one ‘fashion’ are very similar. Similar gloves, one pair ecclesiastical, one ‘fashion’. At the V& A I visited the relatively recently opened Clothworkers’ centre which is in a huge Victorian building just by the Olympia trade exhibition centre. They only have 3 pairs of early knitted gloves so the two hours I had with them allowed me to examine them very closely. There will be more about these in a later post. Last Saturday, as part of the Knitting in the Round project, there was a Sanquhar glove study Day at A’the Airts, the arts centre in Sanquhar. Lynn Abrams from the project gave a presentation about the project, which is focusing on the Sanquhar glove knitting, as well as Tom of Holland who showed his gloves and showed some contemporary designs which use the Sanquhar pattern. 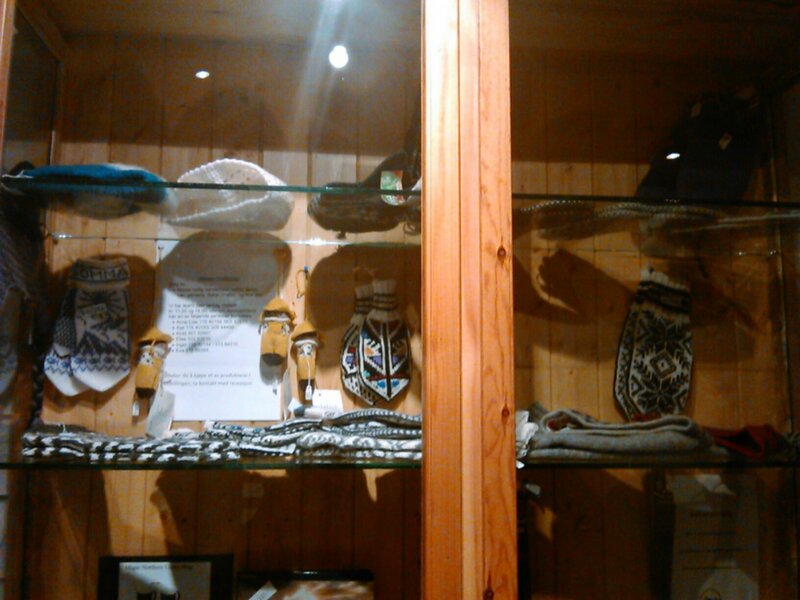 And in A’the Airts window, more Sanquhar goodies. There was also machine knitting, which I love, as the arts centre has had a grant to enable them to buy some state of the art electronic machines and software, on which they are going to produce Sanuqhar pattern scarves and other things. That’s all for now, as I’m off to see some historic gloves from the Glovers Collection in the Fashion Museum in Bath and have to be on the train by 8.30 this morning! At the weekend I went to the gansey symposium held at Sheringham museum. It was wonderful. 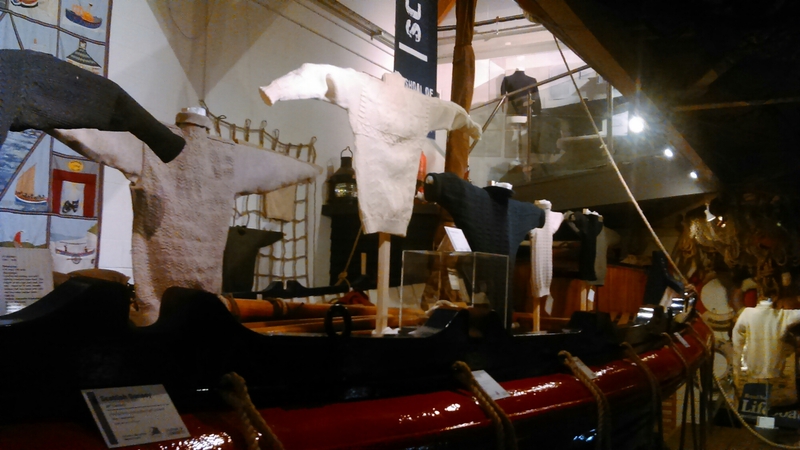 The exhibition has about 30 garments mostly displayed in the lifeboats which are the permanent show there. They looked fabulous, on simple supports in the boats and not behind glass although there were a few in a case that were particularly fine. Many were navy or dark blue but many of the Moray Firth ones varied, fawn, lovat and light blue all being found. There were four speakers, all on a different aspect but each one very interesting. An added bonus was the chance to meet other knitting enthusiasts. Eating seaside fish and chips while discussing knitting must go down as one of life’s finest pleasures. Yesterday I went with Barbara to Scarborough with the KCG trunk show. 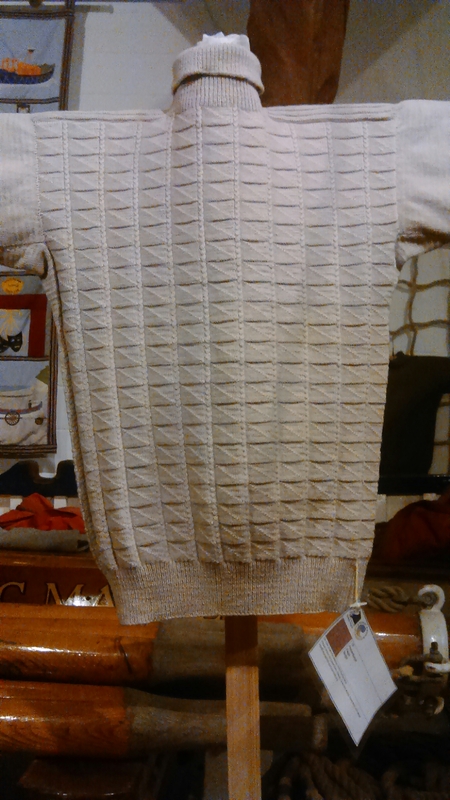 We showed it as part of the Westcliffe gansey knitting holiday. I can’t put in any links as I’m on my mobile. I might be able to add a pic or two but I’ve not had a properly working camera for some months now. It’s fine to use the phone for holidays but not so good for the collection or my gloves. I taught three people to knit at the workshop, one of whom was the keynote speaker, the furniture designer and maker, Fred Baier. Others tried out techniques that they hadn’t done before like using two circulars and knitting two colour rib. It was fun – one person said it was an antidote to the other workshops which were almost all about machinery, albeit digital. Here’s Max with his knitting. and the whole group …. and Fred Baier concentrating hard. 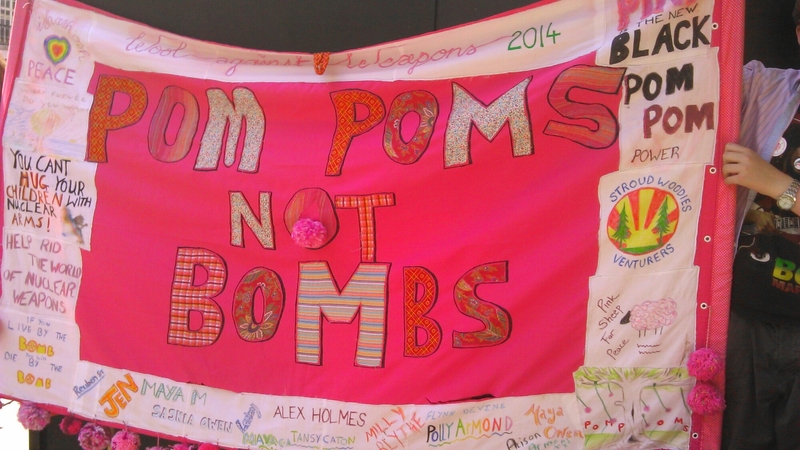 Here’s the banner. You can see the WCF badge on the right. I’m in Lafayette, California, visiting my step daughter. A visit to the LYS was in order this morning where they had copies of Knitting Traditions with my pattern and article in. So I signed the remaining copies and am going back next week with my gloves – I brought them with me – to have my photo taken for their Facebook page. I went on a trip to Northern Norway to see the Northern lights and these were in the hotel, being made close by. I’m at In The Loop 3 (ITL3) the biannual conference that focuses on knitting and I’m having a whale of a time. there’s so many interesting papers and people to meet. And so little time to knit although I have managed to get the second herringbone glove started. Here it is – looking like nothing on earth with four thread markers for the vertical lines and a lot of curl on the cast on (again). I don’t know if I mentioned this but my gloves were selected for the Art, Design and Architecture show at the National Welsh Eisteddfod. It is held every year in the first week of August and when I was learning Welsh I used to go every year – however, in the last few years I have been in the Pyrenees as late July/early August is the best time to be there (no late snow from the winter, no early snow from next winter, no big storms – or that’s the theory). Anyway, I took some decent images of the gloves I had designed to be a set and sent them off and they were accepted – in fact the selectors asked for more! So all ten pairs that I have knitted so far had an outing for a week. I went last Saturday with two friends and met more friends there – it was a lovely lovely day. I was very proud. They have to be sent to Cardiff next week so I am getting very worried about sending them. I think some sort of first class tracked post might do it. I was in London this weekend for a Textile Society research day and managed to squeeze in a visit to the wool show in Somerset House. This is still on this week and is a very classy promotion of wool and all its wonders and manfiestations.nad is organised by the Campaign for Wool. I have just returned from Madison Wisconsin where I attended the Work in Progress Knitting and Crochet Museum symposium. This was an event hosted by Karen Hendricks-Hands at the Wisconsin Historical Society. You can read about it here. And there’s a Facebook page here. 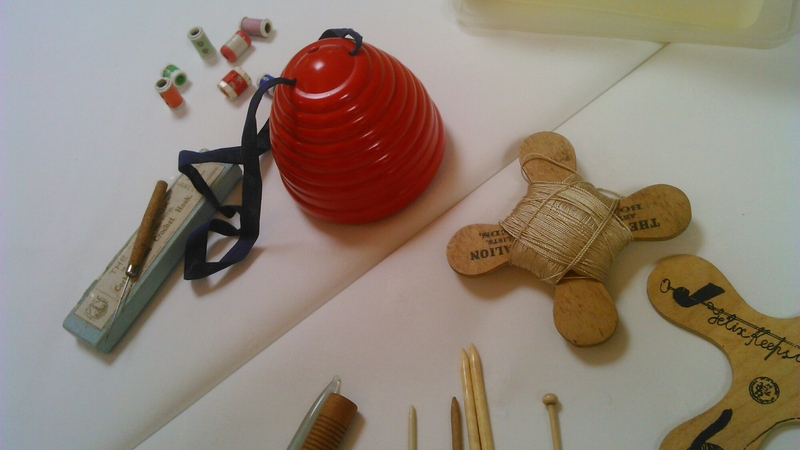 There was an introductory lecture given by Susan Strawn and then a day of presentations and workshops to explore the idea of a museum that would capture the heritage of knitting and crochet. The symposium concluded with Saturday being spent on a workshop and book signing. I took both my own gloves and those from the collection of the Knitting and Crochet Guild. Here I am discussing Mary Allen gloves with Carol from Madison, Wisconsin who has also knitted a pair from the Wordsworth Museum pattern. Gloves, but a different sort! Yesterday I went to the Annual General Meeting of the Knitting and Crochet Guild in Birmingham. There’s more on Ravelry about this. I took some of my gloves for the ‘show and tell’ as I had written about them in the KCG magazine, Slipknot, a couple of months ago. So I took the ones illustrated there, which are the Sanquhar ones of mine and the Mary Allen ones from the collection, plus the Sanquhar Duke pattern ones I’m knitting. but perhaps the wrong sort … ? I spent most of the day at Lee Mills, the home of the Knitting and Crochet Guild collection. Rachael Matthews of Prick Your Finger the yarn shop in Bethnal Green London came to collect the Knitted Wedding which had been stored there. She had a look round and thought the whole place was pretty much a mine of interesting things. 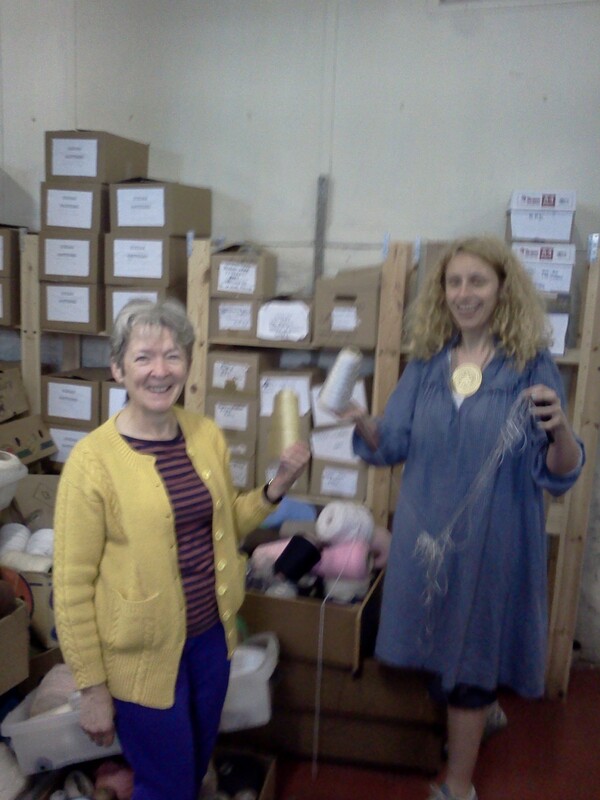 Angharad and Rachael admiring some yarn! Is this the worst picture ever taken? Met by Stan and Linda off the train in Darlington, to go to Saltburn. 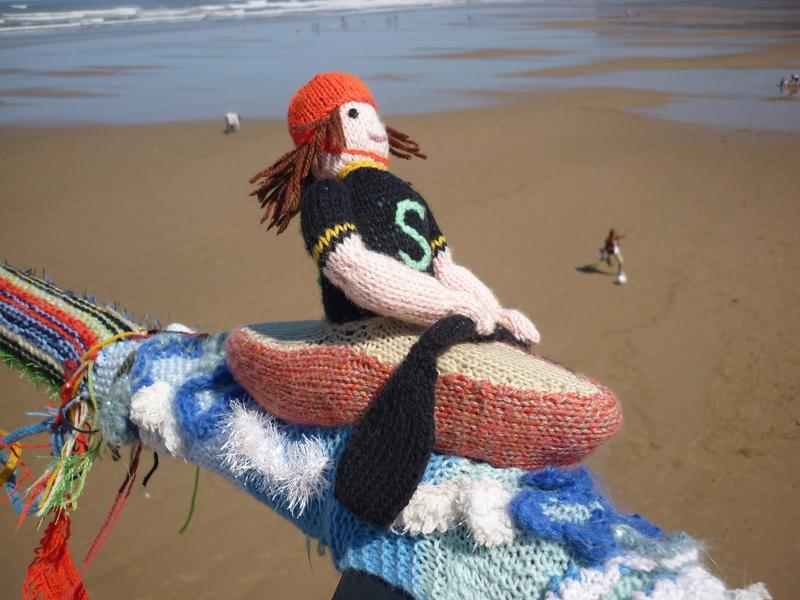 Saltburn Pier in the northwest of England is the site of a massive attack of yarn bombing. 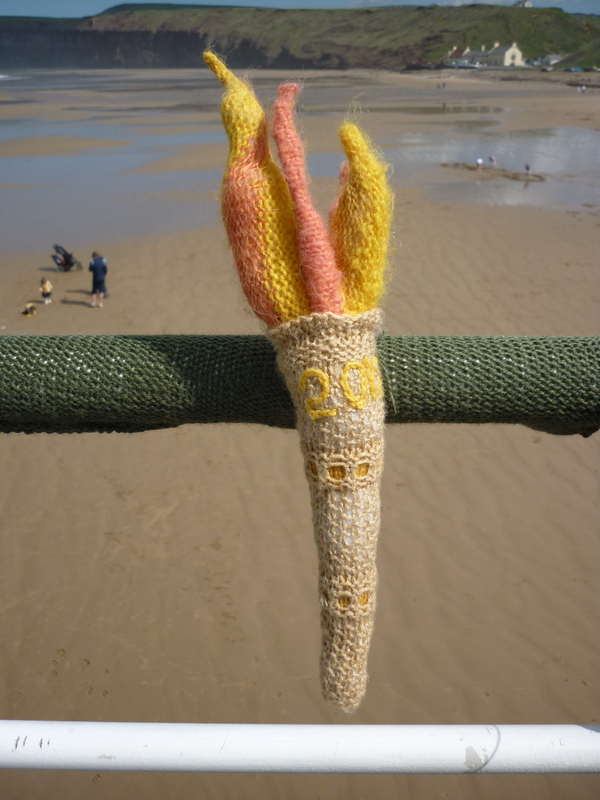 An anonymous knitter has made small knitted figures performing Olympic sports with knitted Olympic medals and rings. The whole show takes about 100 yards of the rail on the pier and is all sewn on. It appeared overnight in March but I hadn’t had chance to go up and see it before last Saturday. Here’s a couple of my favourites. This appearance has brought loads of extra visitors to the place but the identity of the person is still not known. See the BBC news report from awhile ago. 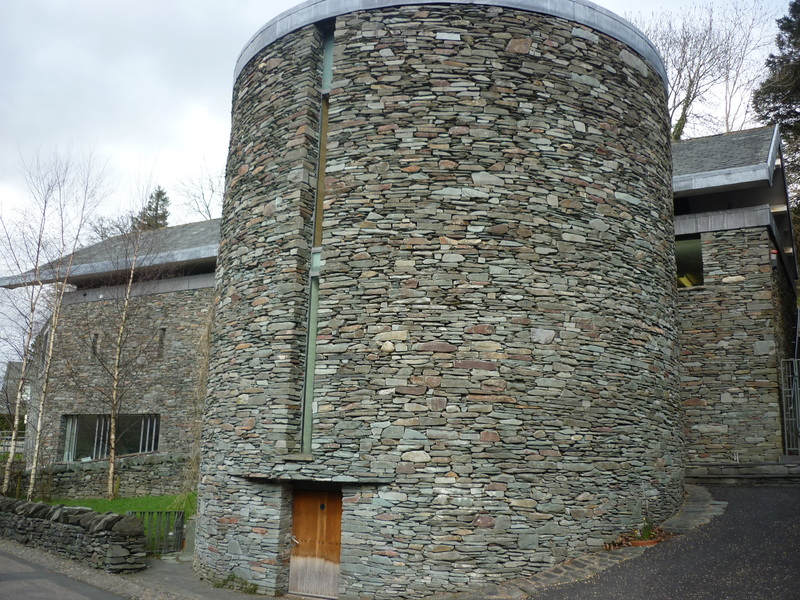 Yesterday, Monday 19th March, I had an appointment to see the gloves in the collection of the Wordsworth Trust at Dove Cottage Grasmere. They have three pairs, acquired rather randomly I think – the George Walton pair, referenced by both Hartley and Ingilby, and Richard Rutt, and two pairs of Mary Allen gloves, one wool and one in what is called silk but might be rayon. I was allowed to handle the gloves, take photos, draw and measure them. The George Walton pair are knitted from wool that looks as if it is single ply. The silk pair are not a pair in my opinion. They are different colours and sizes. I need to learn to draw in order to make accurate observations. Yesterday I made a presentation called at the Textiles Research in Practice (TRIP) conference in Loughborough. It was great because there was a very positive response and lots of interest, which is really lovely. As I result, I am trying to get to grips with this blog and make it do what I want it to – which has proved harder than I’d though all along. There are things that I hadn’t anticipated about blogging – speaking to an unknown audience is hard and then there’s issues about mentioning other people and also publishing documents, which because of copyright issues you can’t do. Getting the tone right is also harder than I thought. am I chatty? Or academic? Or knittery? Another problem is that time on the blog is not knitting time, and I have done less knitting than I would like so far in this project. Ravelry has also proved worth its weight in gold as far as documenting the knitting processes but of course, that is not public access. So I will persist with this and see where it goes.